I am sharing this experience for my son and anyone like him who might have this injury at an early age. His injury occurred on the lacrosse field in April. He was just running along and stepped on an uneven spot and felt the infamous pop and sharp pain. Took him to the doctor who everyone said was the best for youth in Baltimore. told him to tke it easy, no sports, come back in 3 weeks. Walking at school knee goes out terrible pain. Doctor takes an MRI. Still no damage to menicus so go back to therapy and walk with crutches. Therapy gets him staightened out as he can now bend and straighten his leg completely so doctor says wear a brace play soccer if you want in the spring. If ( more like when) the knee goes out we will have to operate. If it doesn't go out we will operate in 2-3 years. Mean while I have been scouring the internet on the subject. The conservative approach has been to wait till the child's growth has slowed or stopped to reconstruct the ACL as to not interfere with the growth plates. A valid concern as growth arrest could be devastating. But as devastating is the damage to the cartilage and menicus that probably will occur or the loss of childhood games and sports by protecting the knee. 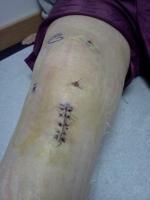 The more modern approach is to reconstruct the ACL with techniques that avoid the growth plates altogether. I found a doctor to do this at the Children's Hospital of Philadelphia who has truly been a godsend. My son's recovery has been very rapid although we are only 3 weeks since surgery. He has very little pain and motion is already returning. I hope at least one parent out there reads this and doesn't settle for the opinion that nothing should be done till their child grows up. There are physicians who can do procedures which others are too vain to admit are beyond their expertise and will never let you know the techniques exist.